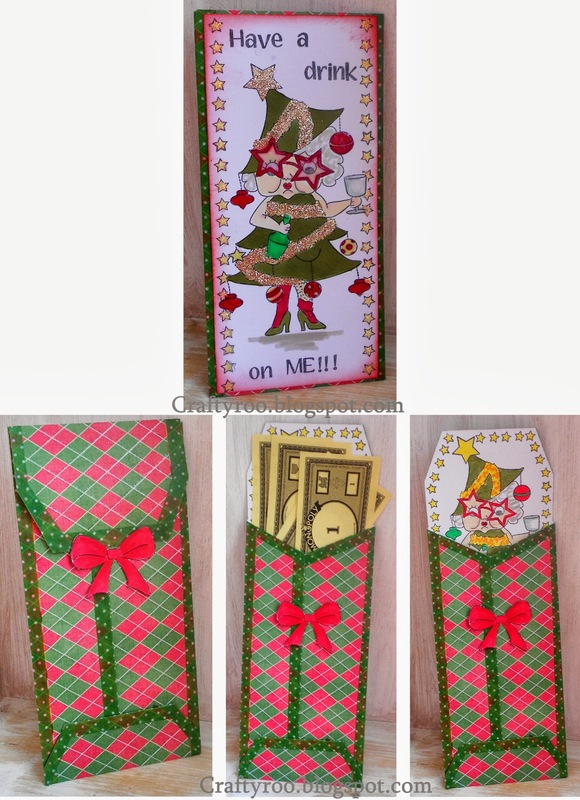 This money wallet is a template I have had for years, so when I saw the new Mullered Mavis' Christmas Party stamp set from Nina Crafts I just had to dig it out of the cupboard!!!! To make this money wallet, I started by cutting it out from some patterned thick paper, then measured the front and cut a piece of white card to fit. Onto it stamped Mavis. I then masked her off and stamped the stars from All Things Christmas Stamp set down the two edges. Across the top I stamp "Have a drink" and across the bottom I stamped "on ME!!!" Using ABC 123 stamp set. I then coloured it in and distressed around the edge. Next I stamped Mavis again onto the inside of the top flap, masked her off and stamped a border of stars around the edge. This was then coloured in too. Around all the cut edges I added Washi Tape to tidy up the cut edges and fixed the wallet together. Onto a small scrap of white card I stamped a bow (also from All Things Christmas) and used it as a fastener for the wallet. Finally I attached Mavis to the front of the wallet and added Glossy Accents to the baubles and glasses, and Stickles to the tinsel!